This training course includes the nine 21 minute classes, and a CDROM "hydroponics and Microfarms" containing over 1000 pages of information on hydroponics and microfarming. Classs 1: Introduction to Simple Hydroponics - Video on simplified hydroponic gardens to produce food and income. Class 2: Making Small Growing Containers - Video on creating hydroponic growing containers out of discarded or recycled materials. Class 4: Substrates Instead of Soil - Video on choosing a substrate to replace soil to fill growing containers. Class 6: Organic Hydroponics - Video on organoponics in Cuba using organic hydroponics. Class 7: Video on pest control. Class 8: Video on daily chores to maintain the garden. Class 9: Video on other uses for hydroponic products for income. 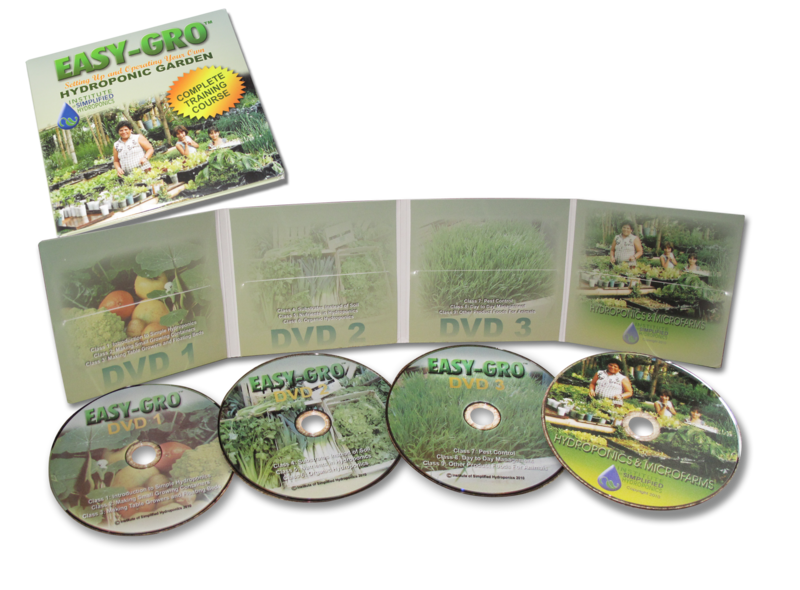 As a Bonus the Hydroponics and Microfarms CD is included with the training course. The CD helps to train others to set up gardens and to troubleshoot problems that might arise.